No plans on a Saturday night? Feeling bored? Why not go to a place where everyone knows your name? Or at least, where everyone knows your face? That place for me is Cafe Fiorello, my own personal Cheers right here in New York City. Along with my friend Mitsuko, I discovered this fantastic Italian-style eatery as recently as June, following the first in a stunning series of American Ballet Theater performances at Lincoln Center. 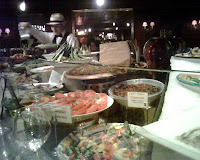 Giselle left us hungry, and this enticing antipasti bar located just across Broadway called to us. Who knew it would become a second home in just a matter of months? Mits and I have faithfully returned on a regular basis since June, and each time we are greeted by the staff with hellos, smiles, glasses of Prosecco... and sometimes even a hug. On first glance, I assumed Fiorello was a tourist trap, grabbing theater and concert-goers. But the more I have spoken with the people seated around me, the more I realize that nearly everyone here is a regular, a local New Yorker who has discovered their own sense of comfort here in this friendly place. Seated at the bar, I have met an endless array of fascinating and sophisticated people from all over the world. The location, the crowds, the food, the scene... it's all so very "New York". So last night, with no place to go and no one to see, I took myself to Fiorello. Cozying up to my favorite spot at the bar, I spent the next 5 hours reveling in how totally comfortable I felt here, enjoying good food, bottomless cocktails, and great conversation with friendly strangers and the now familiar restaurant staff. For as long as I am in New York, and anytime I come back, Fiorello will be a must-visit.